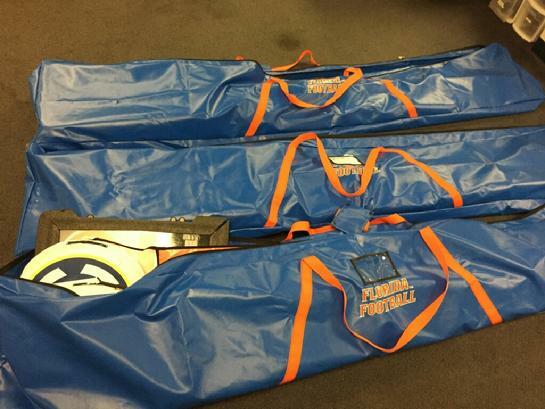 THIS IS A FOOTBALL WATER RESISTANT BALL BAG. LARGE ENOUGH TO CARRY ALL YOUR EQUIPMENT. MEASURES 16x16x28. 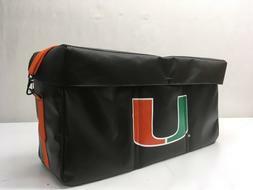 BELOW IS A PADDED FOOTBALL BAG. ALL SIDES ARE PADDED AS WELL AS EACH INDIVIDUAL SECTION TO COMPLETELY PROTECT THE FOOTBALLS. COMPARTMENTS CAN BE REMOVED. U-SHAPE LID. ITEM #PFB12 HOLDS 12 FOOTBALLS. MEASUREMENTS ARE 42X13X13. $178.00. ITEM #PFB6 HOLDS 6 FOOTBALLS. MEASUREMENTS ARE 24X13X13. $150.00. 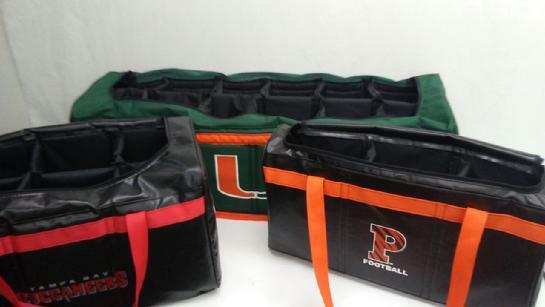 THE SIDELINE BALL BAG BELOW IS FULLY PADDED & WATER RESISTANT. HAS A SMALL MESH POCKET INSIDE FOR A TOWEL. HOLDS 5 FOOTBALLS. 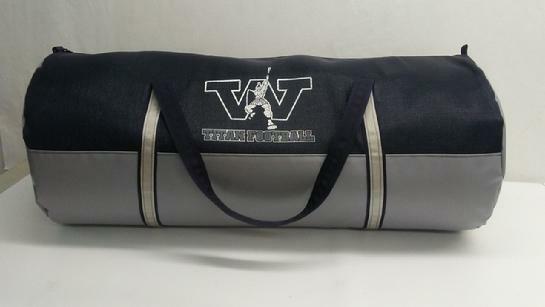 BELOW IS OUR POPULAR EQUIPMENT/HELMET BAG! 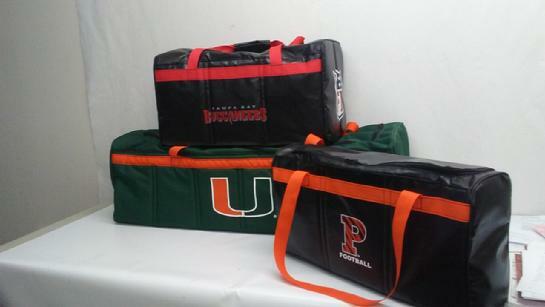 THE ROUND DUFFLE HAS ROOM TO CARRY ALL OF YOUR EQUIPMENT! CAN BE MADE WITH NYLON, MESH OR VINYL, OR ANY COMBINATION. YOUR CHOICE. THE EQ BAG IS MADE WITH A COMBINATION OF MESH AND VINYL MATERIALS. THERE IS A PADDED POCKET INSIDE ON ONE END TO PROTECT YOUR HELMET. MEASURES 36X16. THE DELUXE EQUIPMENT BAG IS MADE WITH A COMBINATION OF MESH AND VINYL MATERIAL. IT HAS 1 MESH HELMET POUCH INSIDE. 4 WINDOWS. SNAPPED HANDLE ON TOP. STURDY HANDLES ON EACH END. MEASURES 34X18. 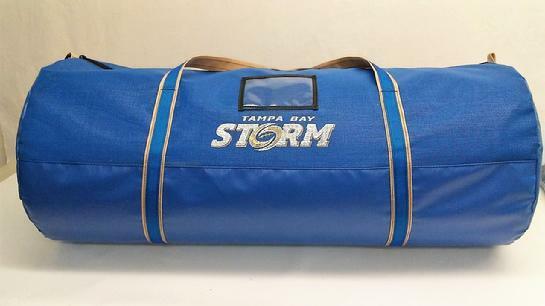 THIS LARGE SQUARE DUFFLE IS MADE WITH A COMBINATION OF MESH AND VINYL. THE MESH HAS THE CONVENIENCE OF BREATHABILITY. THE VINYL GIVES IT THAT EXTRA STURDY REINFORCEMENT ON THE BOTOM AND ENDS. HANDLE ON TOP AND ON EACH END OF THE BAG. MEASURES 16x16x28. HERE ARE THE PERFECT SHOULDER BAGS. THE BAG ON THE LEFT HAS ONE POCKET ON THE FRONT. IT MEASURES 6x14x22. 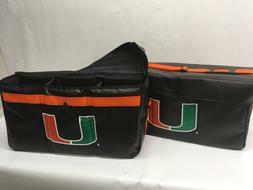 THE BAG ON THE RIGHT HAS TWO POCKETS, ONE ON THE FRONT AND ONE ON THE BACK. IT MEASURES 6x18x13. 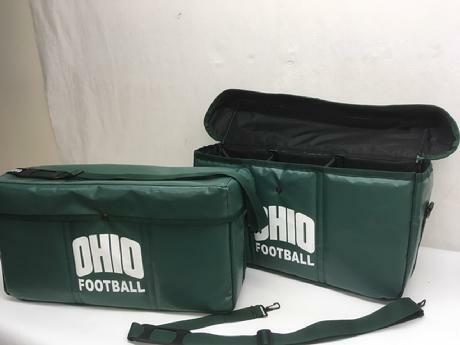 THE PADDED FOOTBALL HELMET BAG HOLDS 8 HELMETS. FULLY PROTECTED PADDED COMPARTMENTS KEEP EACH HELMET SECURE. THERE IS A PADDED SHEET THAT SEPARATES THE FRONT SECTION FROM THE BACK SECTION. CARRY WITH HANDLE ON TOP OR THERE IS ALSO A HANDLE ON EACH SIDE FOR ASSISTANCE IN CARRYING IF NEEDED. MEASURES 24x24x16. CHAIN SET BAG. MADE WITH A DURABLE VINYL MATERIAL. ID WINDOW. MEASURES 105x20x5. IF YOU WOULD LIKE TO PERSONALIZE YOUR ITEM(S), MONOGRAMMING IS AVAILABLE.